"This interactive, computer-based practice system helps students get better faster, and makes practicing more fun! 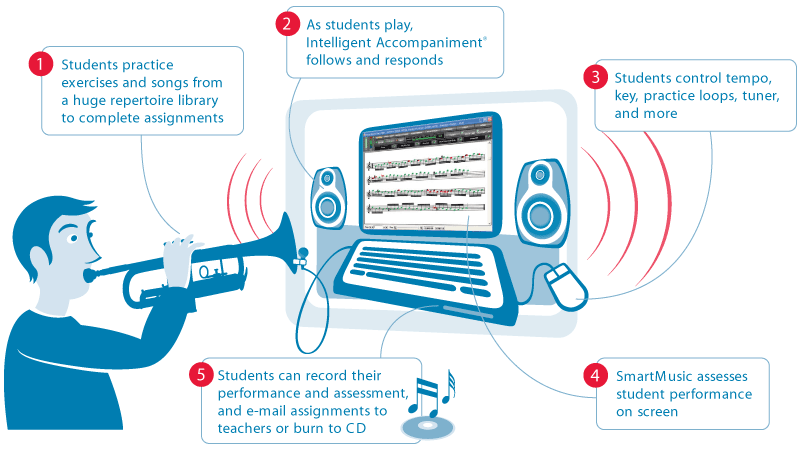 With amazing accompaniments for more than 30,000 titles, challenging exercises, and the ability to record personal CD's, SmartMusic is the future of music learning." The Pace High Bands will be using SmartMusic this year to help students practice and continue to improve their skills. While the purchase of this software is not required, it is highly encouraged. We recently began utilizing the software in practice studios at school but time for your student to utilize this resource during school hours is limited. If you or your student is interested in this amazing tool for improvement then keep reading below! The SmartMusic program is completely optional but will make an enormous impact on the quality of practice for your student! The program itself is free to download but requires the purchase of a yearly subscription per computer. To find out more and purchase a subscription click the link below! Then, ENROLL in a band class!